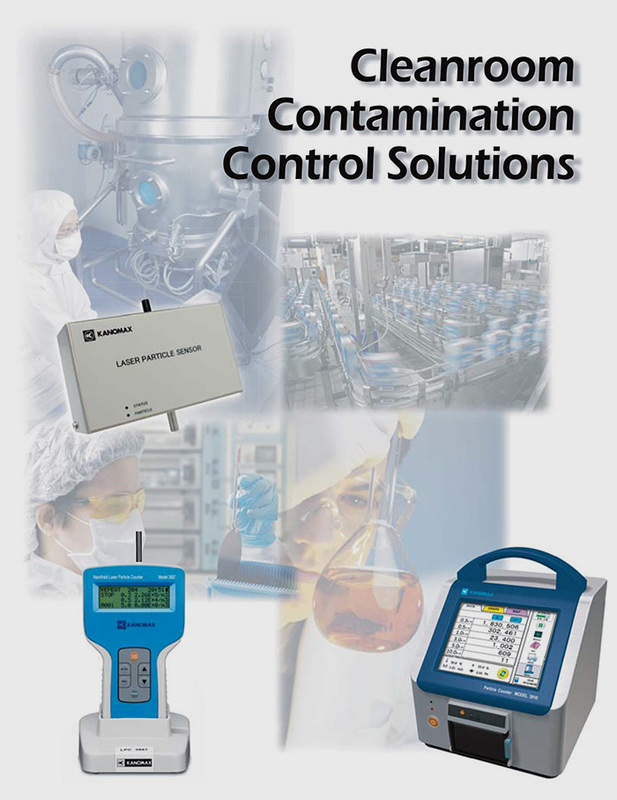 Laser particle counters for contamination control, flow and relative humidity. These products are designed to serve applications from continuous monitoring to certification for any clean environments in the pharmaceutical, electronics, medical, and food industries. Handheld and portable particle counters help users to enact spot checking in order to meet the level of particulate contamination in the clean environment required by industry standards, such as ISO 14644-1. 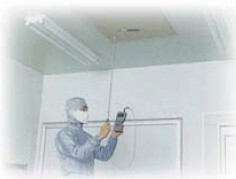 Remote particle counters and remote particle sensors are both used in cleanroom monitoring systems implemented as control solutions for continuous facility monitoring either for internal investigations or to meet regulatory requirements. Model 3886 and 3887 are CE certified handheld laser particle counters used to measure the amount of particles in air, especially in a clean room. 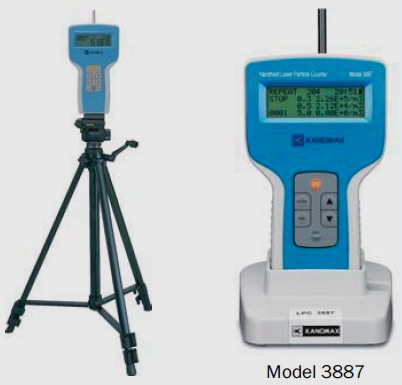 The Model 3886 measures 5 particle sizes simultaneously with optional multi-functions, such as air velocity, temperature, and humidity. Its low air velocity measuring function is suitable for laminar flow units. The Model 3887 is a light weight and easy to use instrument. The 3910 & 3905 are the smallest 6-channel portable air particle counters in the industry; with a 50 LPM and 1 CFM flow rate respectively and a 0.3 micron sensitivity. Both units feature a large colour touchscreen, streamlined, user-friendly interface and preprogrammed standards mode to guide you through the measuring and certification process it may also be the most helpful. The most accurate hotwire anemometer (in its class) in the world. Just some of its capabilities include: up to 8 interchangeable probes for air velocity, temperature, humidity, and differential pressure. 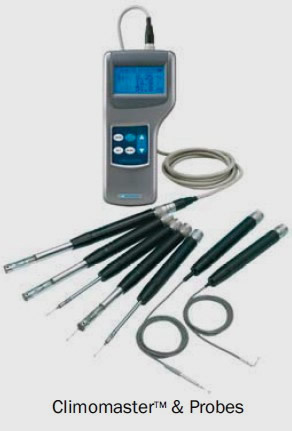 Our new Kanomax TABmasterTM is the perfect tool for accurate supply and return airflow measurements. Interchangeable hoods make it a snap to sample the air for any duct size. The unit is lightweight and easy to handle. The full colour screen can be tilted so it's at the optimal viewing angle at any height. This guide is a brief look at how the Particle Counters for air can simplify the job of certifying your ISO class cleanroom. The ISO procedure can be broken down into 7 basic steps to certify a cleanroom. Let’s take a look at these steps and then we’ll go over how the features of particle counters for air can help you with the job. Step 1: Calculate the number of locations that need to be sampled based on the cleanroom size. Step 2: Determine the particle sizes in the air to be measured, max concentrations allowed and the minimum sampling volume at each location. Step 3: Measure the particles at each sampling location. Step 4: If you are performing multiple samples at each location take the average from each location. Step 5: Take an average of the measurements from all the locations. Step 6: If the number of points sampled was between 2 and 9 then calculcate the 95% UCL. Step 7: Determine if the cleanroom passed or failed by comparing the UCL to the maximum particles per cubic meter as shown on the ISO table. The 3905 and 3910 particle meters for air have a Standard mode that allows you to enter the area of the room in cubic meters. Once this is done the instrument will calculate how many points need to be measured. You can still adjust the number of points manually if desired, but if you are following the ISO standard the instrument does the calculation for you. The cleanroom certifier will need to determine these numbers per the ISO procedure. It’s important to note the flow rate of the 3886 and 3887 is 2.83 L/min, the 3905 is 28.3 L/min, and the 3910 is 50.0 L/min. If you will be certifying multiple cleanrooms and typically need to samples a high volume of air then the 3910 is a better choice with its higher sampling rate. 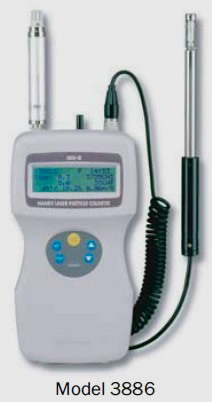 The 3887 is the perfect tool for smaller air samples. Both instruments can be programmed to sample for a specified length of time making it easy to sample precise volumes of air flow. Step 3: Measure particles at each location. 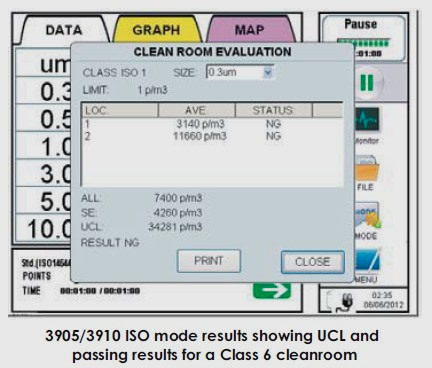 The 3887 has an ISO mode that will allow you to program it with the number of sample points and sample duration needed to certify the cleanroom. 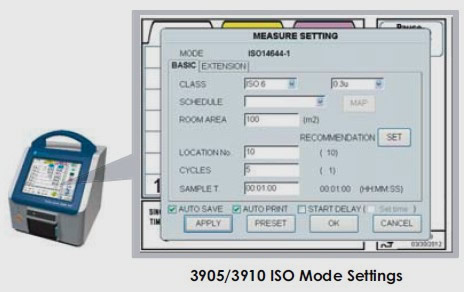 The 3905 and 3910 have a similar mode called Standard mode that includes a configurable setup to certify ISO (as well as other standards such as EU GMP). You can even upload a map of your cleanroom and specify the measuring locations on it in the particle counters. Average the measurements taken at each location, then average the final results of the particles in the air from all locations and calculate the UCL. Both instruments will automatically calculate the averages and the UCL for you. These steps are essentially eliminated from your workload. You can determine if the cleanroom passed or failed by comparing the UCL to the maximum particle concentration allowed as shown on the ISO table. 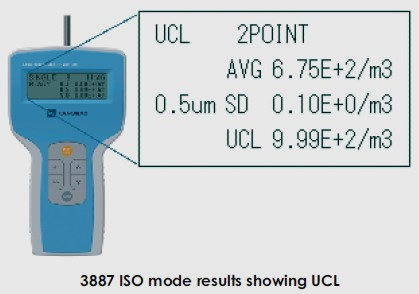 The 3887 will calculate the UCL for you and you can just compare the final number to the ISO table. The 3905 and 3910 are programmed with the ISO standards and will tell you on the spot if your cleanroom has passed or failed. With its built-in printer it can even issue an on-the-spot report. 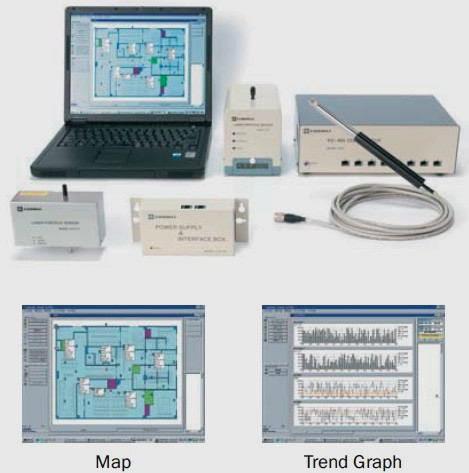 The data logging and ViewLinc PC software package is a powerful tool for large scale, continuous facility monitoring. 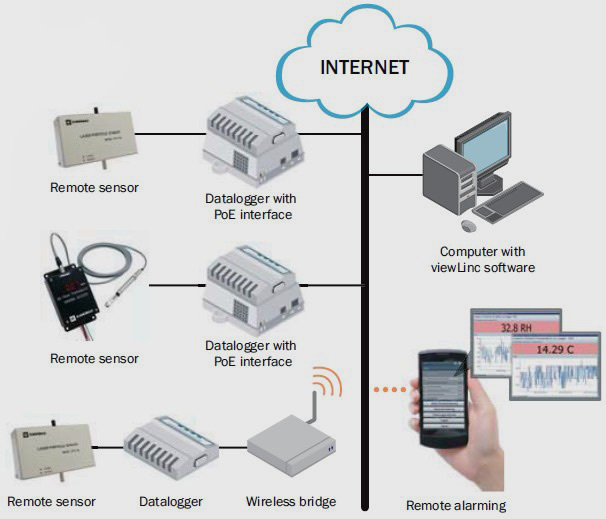 Sensors (such as particulate, temperature, humidity and pressure) placed in critical or key locations connect to data loggers, which in turn can integrate with an existing network (wired or wireless) and transfer the data to the system software. The software then provides remote monitoring, alarm warnings and reporting. Remote alarms includes: emails, text messages and even phone dial-out to notify operators or administrators. 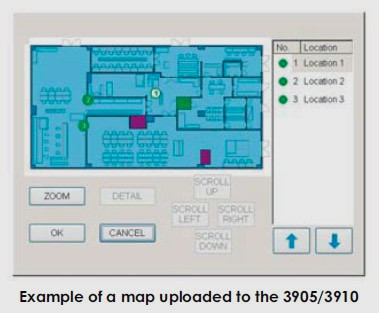 Using this system a facility manager can remotely monitor several facilities via the internet. 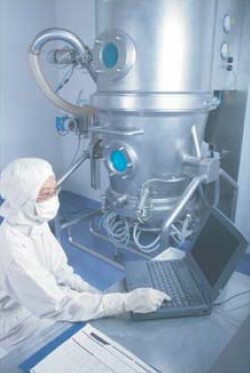 Kanomax Cleanroom monitoring System (CRMS) provides an automated means to monitor and gather airborne particle counts and other parameter levels in controlled environments. The CRMS allows users to perform a variety of functions from their PC including the alteration of alarm information and the viewing of particle count concentrations. The system is designed with a modular nature so you can purchase exactly what you need for your particular application. Whether you need a single sensor or two located at critical areas or a full multi-sensor, 24-hour monitoring system, Kanomax can work with you to provide the perfect system. 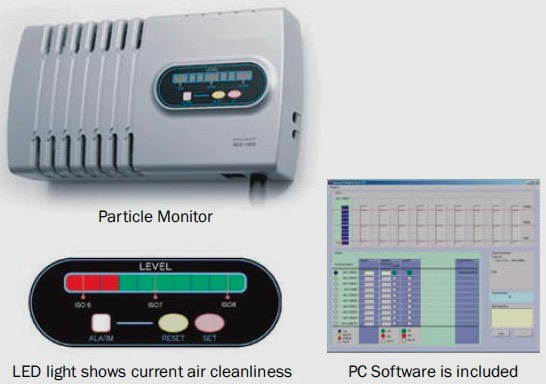 The new AES-1000 Basic Particle Monitoring System is designed to check particulate levels for air process monitoring. The instrument offers a simplified, easy-to read display which shows the current air cleanliness level at a glance, based on the ISO scale. An LED light continuously displays the current condition. The sensor is easy to setup anywhere it's desirable to check particulate levels, such as critical areas and heavy processing zones. It can be integrated with an existing network by using a standard LAN/Ethernet cable. PC monitoring software comes standard with the sensor. 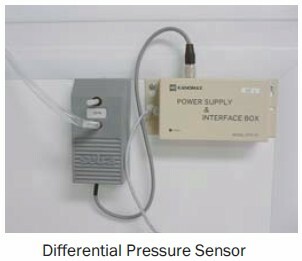 Kanomax sensors with analog output are designed to fit into your existing monitoring system, or they can be used as a stand-alone unit to monitor a critical area when connected to an alarm or controller. The air particle sensor is available with both 0.1 and 1.0 CFM flow rates. Our airflow transducer is available with many different probes to suit your specific application needs. Calibrate the environmental settings within the building for meeting occupant comfort requirements, achieve HVAC design specifications, extend maintenance intervals, energy conservation, and efficient operation. 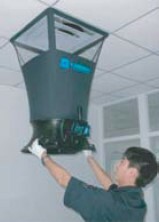 Kanomax AnemomasterTM series measure in-duct airflow and static pressure to maintain and inspection HVAC systems. Measure a variety of parameters important for monitoring and maintaining occupant thermal comfort while helping to assure healthy indoor environments. Kanomax IAQ monitor Model 2211 and Gas Monitors help facility managers to control thermal comfort and to detect sick building syndrome in the building. Measure parameters including dust concentration, temperature, air velocity, gas concentration, indoor air quality, ventilation performance, pressure differential and humidity to find hazards in occupational environments. 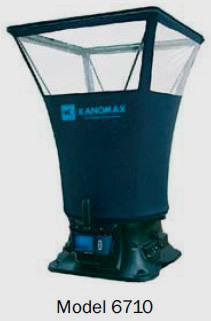 Kanomax Piezobalance Dust Monitor Model 3521 and Digital Dust Monitor Model 3443 implement dust exposure testing to protect workers. Nanoparticles are becoming more common place and are a growing health concern. 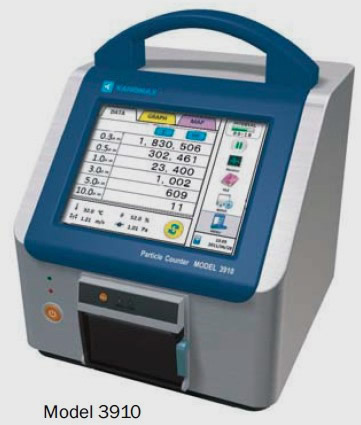 Kanomax is ready to help you monitor nanoparticles with our Nanosolutions line: including PAMS (Portable Aerosol Mobility Spectrometer) and InfiTOF, a new innovative multi-turn time-of-flight mass spectrometer that's small enough to be used in the field.